NOTE: This is the old page, please go to the new one. For a while I have been offering experimental versions of GExperts. These versions are always based on the current SubVersion/CVS repository code of the GExperts project. In addition to the normal functionality they include the code formatter formerly known as DelForEx. The code has kindly been donated by Egbert van Nes. Apart from integrating it into GExperts I have also done a lot of cleanup and bugfixing to the formatter code. It also knows some of the new (with Delphi 200x) language constructs. Also, this version tries to preserve the bookmarks and breakpoints (which unfortunately doesn't always work). To install it, you must first download and install the corresponding release of GExperts (currently 1.36). Afterwards you copy the file preview.pas and all the .ini files to the GExperts installation directory. In addition you need one of the .dlls. Choose the one that corresponds to your Delphi version and whichever expert type you prefer and replace the existing GExpertsXxxx.dll file with the one from the ZIP archive. The difference between an editor expert and a regular expert is mainly where you find the configuration options. 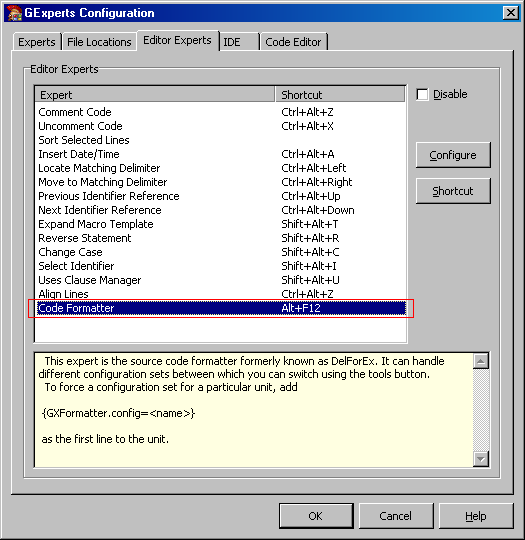 Regular experts are listed directly in the GExperts configuration dialog. There you can define a shortcut and by pressing the Configure button you can open the expert's own configuration dialog. Also, a regular expert has got an entry in the GExperts main menu. 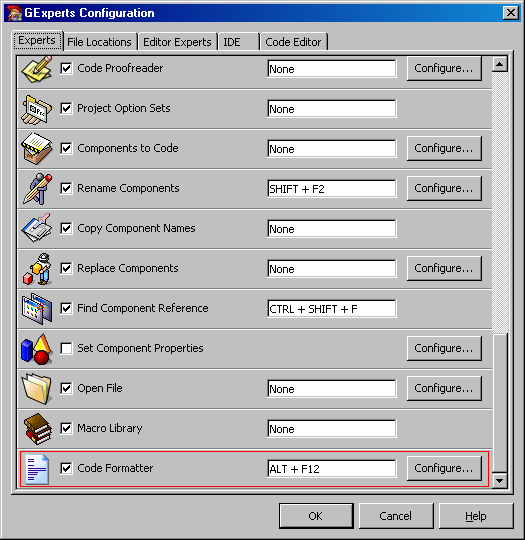 Editor experts are listed on their own tab page of the GExperts configuration dialog. Again there you can define a shortcut key and open the configuration dialog. They are listed under the GExperts menu's Editor Experts entry but are usually activated using the configured shortcut. Several people have asked me to provide the source code. It has always been available from the GExperts SubVersion repository Look into the formatter branch (old versions were based on the CVS repository. ).